They also manufactured a bespoke pile table that showed off the joint types utilised in their precast concrete piles. The joint displayed in the top part of the table’s reinforcement cage is the Class A joint which is designed and patented by Centrum Pæle A/S in Denmark. Manufactured to BS EN 12794, the A-Joint pretensions the connection between the pile segments to be joined, thereby inhibiting the ingress of water or corrosive agents. This means that it can be used for hard pile driving without losing its properties. Displayed in the lower section of the reinforcement cage is the Class D joint, introduced specifically for 200/250/300mm square piles and manufactured to the same high standards. This joint is more economical for use when lateral tension is not an issue. 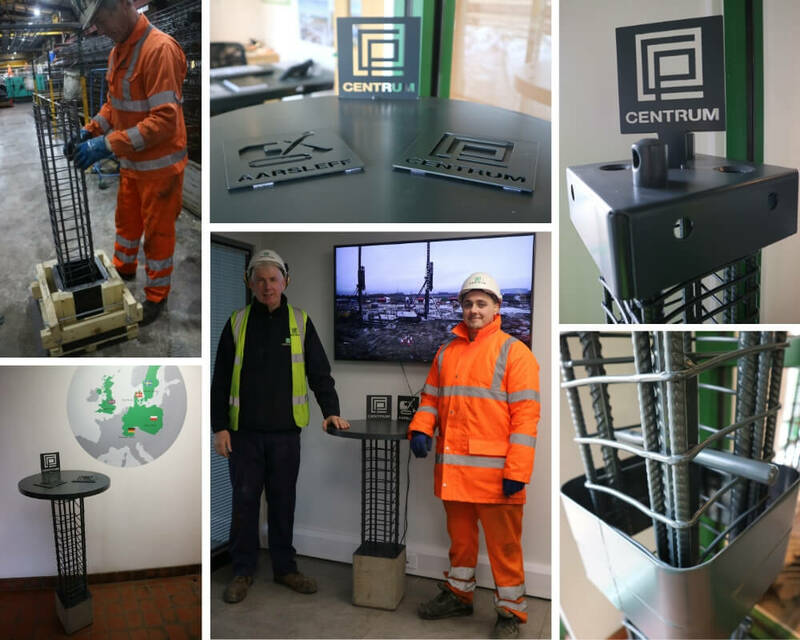 The pile joints used by Centrum Pile are recognised as being the strongest, most durable pile joints available in the UK and across Northern Europe. The mould was then filled with concrete – from Centrum’s onsite batching plant -and left to cure for 24 hours. The concrete mould was then stripped – the wooden sides were taken apart to release the concrete base without damaging it. The reinforced cage was cut and levelled to the desired height, and the prefabricated table tops were welded to the top of the cage. The table tops were then sandblasted, and powder coated, with an anthracite coating applied to provide a shine and clean finish. Aarsleff Ground Engineering and Centrum Pile’s logos were then laser cut into plaques and stitch welded to the table top in the same coating to match the quality finish of the table.